Restaurants now have more control over their menus in OpenMenu by having the ability to disable menus, menu groups and menu items. This means restaurants can turn off items without removing them from the OpenMenu Creator. Disabled items won’t show on any menu renderings, like Facebook or their website, but will continue to be available in the OpenMenu Creator. How can we make our OpenMenu Creator even better, let us know. 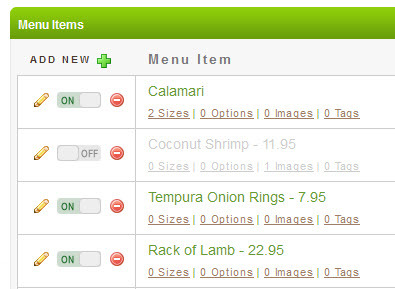 ← Why a common menu platform is required? This is a BIG help! Thank you. Can’t display in two menu because of the unique ID’s that each menu item gets but we are looking into creating a function so menus, menu groups and menu items can be cloned or linked. Just not sure how to do this without adding more complexity to the OpenMenu Creator. Thanx for letting us know what you need to make your life easier.